Many adults at some point begin to experience presbyopia or a reduced ability to see things that are close, as they get older. As people around the world are living longer, a significant number of individuals are developing the condition, which currently cannot be avoided. Theories about the cause of presbyopia are that the eyes' lenses will begin to harden by the age of forty, making it more difficult for the eyes to focus in on something, especially an object close by. Those with presbyopia usually deal with near visual impairment by holding a newspaper far away or standing away from the object they are looking at. Transitions from focusing on distant objects to closer ones are often strenuous for people with presbyopia. This stress could worsen the situation resulting in headaches, eye strain or fatigue. The most common corrections for presbyopia are bifocal lenses or progressives (PALs). A bifocal lens has two prescriptions for vision, the main part of the lens has a prescription for seeing things at a distance and the other part of the lens is for seeing things nearby. Progressive lenses work similarly to bifocals, however they have a more subtle gradient between the two prescriptions. Wearers can more easily change focus, as they might if they had uninhibited eyesight. An alternative would be reading glasses which are usually worn just when needed as opposed to all day. 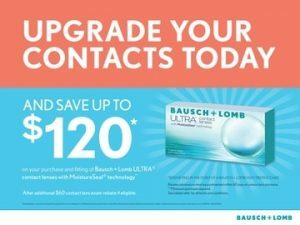 If contact lenses are preferred over glasses, you might want to consider multifocal contact lenses. Multifocals don't work for everyone and can sometimes be uncomfortable, so it may take a few tries to figure out if and in what combination they work for you. Additionally, there are options for other procedures including surgery available that may be worth discussing with your optometrist. A significant number of people find the most success by combining options for presbyopia. Also, since presbyopia will continue to deteriorate with age, it is likely that you will be required to continually adjust your prescription. With the population growing older, there is a significant amount of research being done to identify more and perhaps more permanent treatments for presbyopia. If you are beginning to see symptoms of presbyopia, call for an appointment with your Danbury, CT optometrist. A return to normal eyesight is just a quick call away!